Regarding trails under normal usage, poison ivy stays in its place on the ground, so once a trail is improved and the brush is pushed back to normal distance, hikers and cyclists need not fear it. Wandering into the woods will bring you in contact with it, as well as handling a dog that has come into contact with it. We were exposed to it yesterday while picking up all the nonsense that was hiding under the shrubbery. 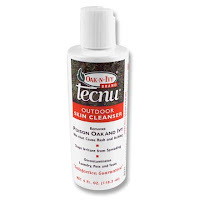 My favorite anti-Poison Ivy aids are Tecnu and Ivarest. 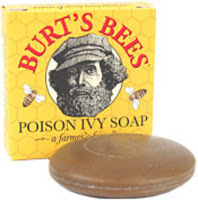 Usually I wash my hands and face with a cleanser designed to remove Poison Ivy oils, when I come in from the woods, either Tecnu or a bar soap. If I miss a spot, the Ivarest helps negate the itch, but it’s that lovely pink paste that tells the world what you have been up to in your off hours. IF the you can’t ignore the itch, cover the spot with a non-adhesive bandage. “The reaction caused by poison ivy, urushiol-induced contact dermatitis, is an allergic reaction. Around 15% to 30% of people have no allergic response, but most people will become sensitized with repeated or more concentrated exposure to urushiol. Reactions can progress to anaphylaxis. Urushiol binds to the skin on contact, where it causes severe itching that develops into reddish colored inflammation or non-colored bumps, and then blistering. These lesions may be treated with calamine lotion, Burow solution compresses, or Aveeno baths to relieve discomfort. In severe cases, clear fluids ooze from open blistered sores and corticosteroids are the necessary treatment. The oozing fluids released by itching blisters do not spread the poison. The appearance of a spreading rash indicates that some areas received more of the poison and reacted sooner than other areas or that contamination is still occurring from contact with objects to which the original poison was spread. The blisters and oozing result from blood vessels that develop gaps and leak fluid through the skin; if the skin is cooled, the vessels constrict and leak less. If poison ivy is burned and the smoke then inhaled, this rash will appear on the lining of the lungs, causing extreme pain and possibly fatal respiratory difficulty. If poison ivy is eaten, the digestive tract, airway, kidneys or other organs can be damaged. An untreated rash can last up to four weeks.